1- The Truth About Relativity Why Everything Is Relative — Even When It Shouldn’t Be? According to his researches and experiments, Ariely believes that we — as human beings — don’t have a value meter that could tell us what things do really worth. We don’t know what we really want until we see it in a context. We usually evaluate things according to the relative advantage of one thing over the other and hence estimate the value accordingly. For example, let’s consider the Economist subscription example mentioned in the book. 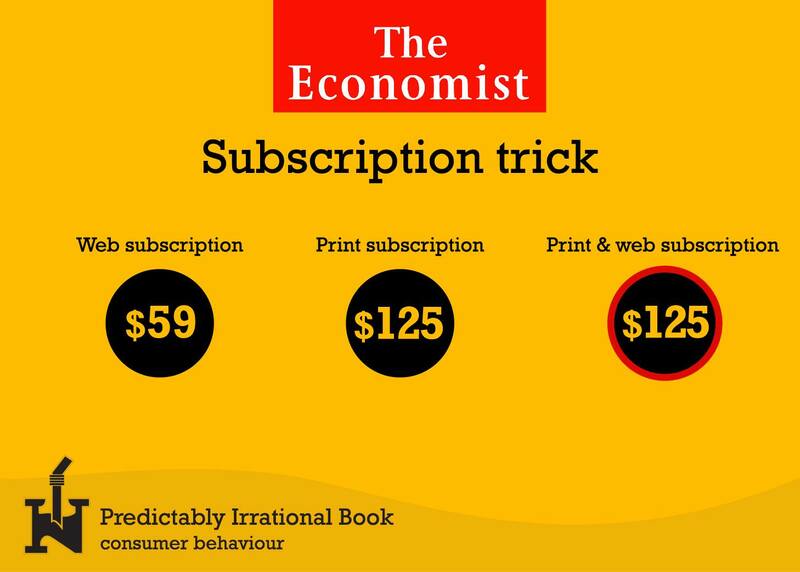 Economist magazine placed an ad on their website about their subscription (Figure 1). Ariely wondered who might consider the print option only while in fact that both print & web subscriptions have the same price as print only? Internet-only subscription for $59–16 students, Print-only subscription for $125 — zero students, while Print-and-Internet subscription for $125–84students. Now he ran the same experiment on another 100 students, with the only difference of opting out the Print subscription option. Now the students have only 2 choices (A. Internet-only for $59, B. Print-and-Internet for $125). Should this change the outcome? Apparently, it did. 68 of the students chose the Internet-only option for $59, up from 16 before. And only 32 choose the combination subscription for $125, down from 84 before. What could have possibly changed their minds? Nothing rational, I assure you. It was the mere presence of the decoy that sent 84 of them to the Print-and-Internet option (and 16 to the Internet-only option). And the absence of the decoy had them choosing differently, with 32 for print-and-Internet and 68 for Internet-only. 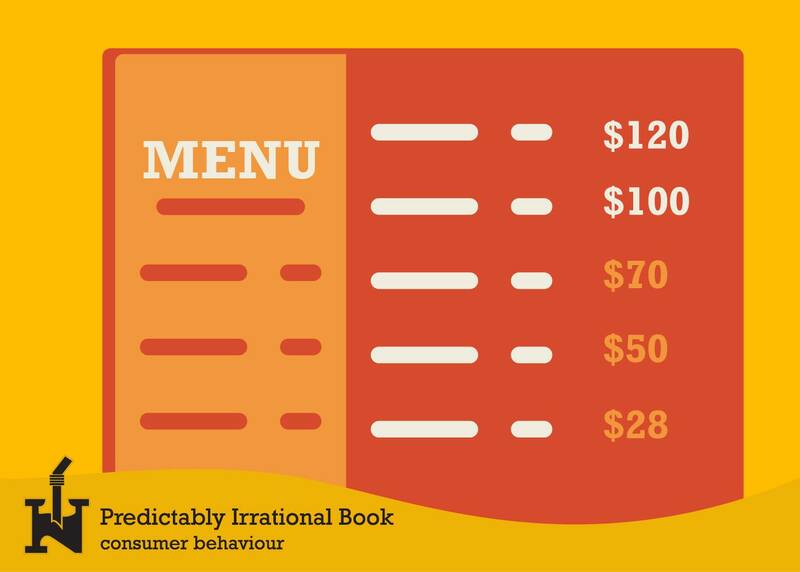 Another insight one relativity, let’s consider restaurants menu pricing. Usually, high price entrées on the menu boost revenue. Although that seems to be rational, however, the reason why it boosts revenue is not that rational. Usually, people, in general, don’t buy the most expensive dish on the menu rather than they tend to order the second most expensive one, hence restaurants engineer such dishes to deliver the higher profit margin. In this book, the author stated that human behavior somehow resembles one of the goslings. How is that? An interesting thing about goslings as naturalist Konrad Lorenz discovered “upon breaking out of their eggs, become attached to the first moving object they encounter (which is generally their mother)”. The same applies to human beings as we usually tend to anchor our lives on decisions we made in the past, stick to them, and measure everything with respect to that anchor considering that it was a right one. For example, people moved from low-priced cities to moderately-priced ones don’t increase their spending to match the new market, even if this means we will live in smaller houses, or decrease our standard of living. The same thing happens when we move to a less-priced city, we will spend the same with no respect to our needs. 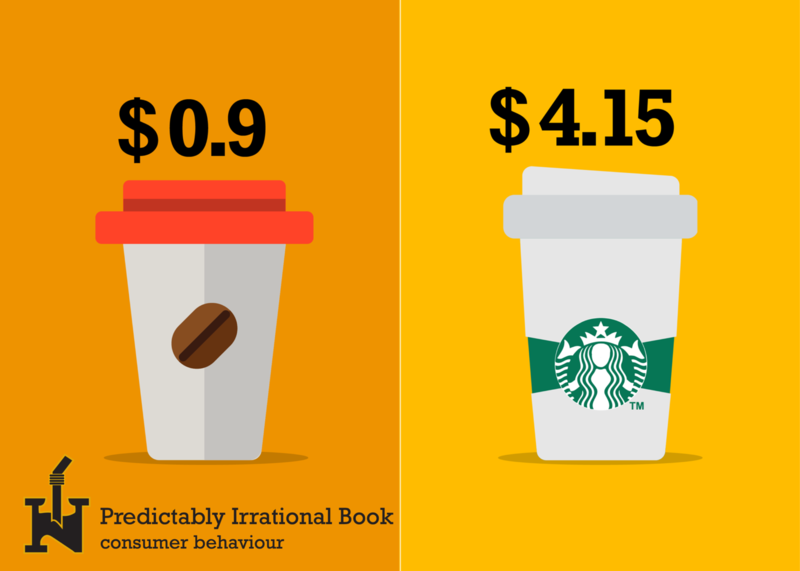 How did we start spending $4.15 on a cup of coffee when, just a few years ago, we used to pay less than a dollar? When Howard Shultz created Starbucks, he was as intuitive a businessman as Salvador Assael. He worked diligently to separate Starbucks from other coffee shops, not through price but through ambience. Accordingly, he designed Starbucks from the very beginning to feel like a continental coffeehouse. The early shops were fragrant with the smell of roasted beans (and better-quality roasted beans than those at Dunkin’ Donuts). They sold fancy French coffee presses. The showcases presented alluring snacks — almond croissants, biscotti, raspberry custard pastries, and others. Whereas Dunkin’ Donuts had small, medium, and large coffees, Starbucks offered Short, Tall, Grande, and Venti, as well as drinks with high pedigree names like Caffè Americano, Caffè Misto, Macchiato, and Frappuccino. Starbucks did everything in its power, in other words, to make the experience feel different — so different that we would not use the prices at Dunkin’ Donuts as an anchor, but instead would be open to the new anchor that Starbucks was preparing for us. And that, to a great extent, is how Starbucks succeeded.